1. 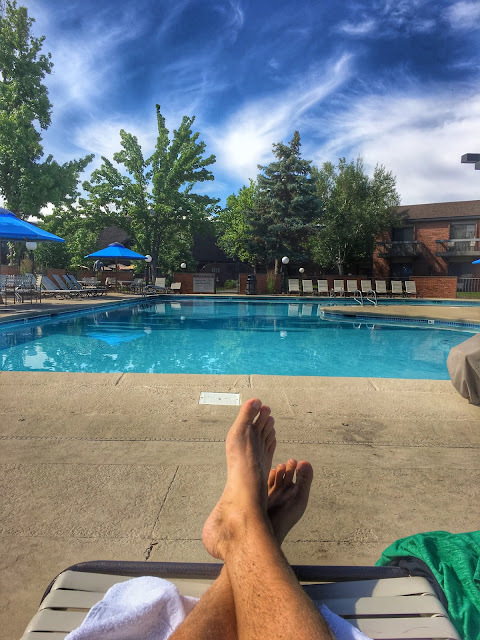 Amenities Are Key: A pool is a must (though I’ll likely dip a toe, declare it too cold, then retire to a lounge chair with a cocktail – my natural habitat). But not just any pool; outdoor is non-negotiable. 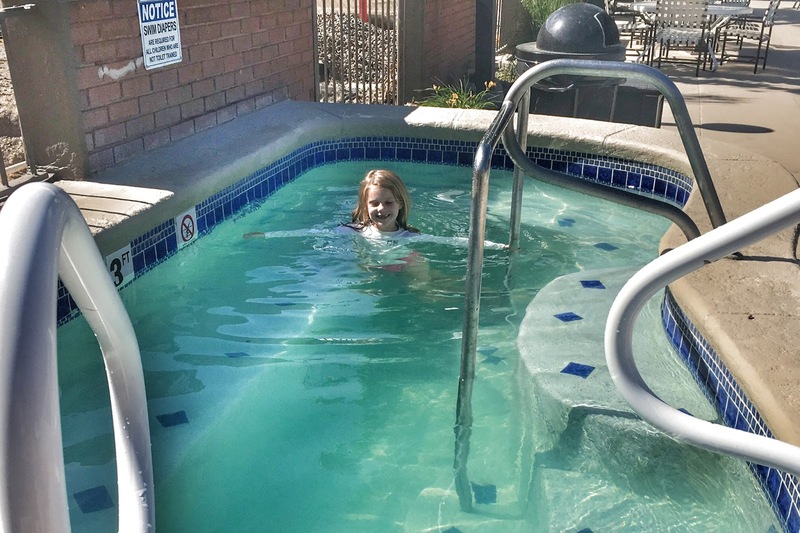 You don’t want to spend an afternoon in the chlorinated confines of an indoor pool. The reason we return again and again to The Riverside is that the pool is not only big and beautiful, but the poolside areas complement the space, complete with oversized hot tub, staff to bring you drinks and food, and live music from the adjacent Sandbar, a small, outdoor bar and grill on the hotel grounds. 2. Don’t Try to Do Everything: Had we endless energy, we could have ridden bikes along the Greenbelt (Boise’s endless miles of paved path along the river), rented paddleboards or kayaks at Quinn’s pond, used the gym (don’t laugh, I actually did it once during a previous staycation and yes, I’m still chubby), and knocked a few work-related items off of our lists. But when you try to do everything, your staycation starts to feel less like a vacation and more like a marathon. Incorporating adventure into your weekend is fun, but downtime is, too. 3. Do More than Nothing: On the other hand, while lounging by the pool is fun, breaking it up with occasional entertainment makes the staycation something special. 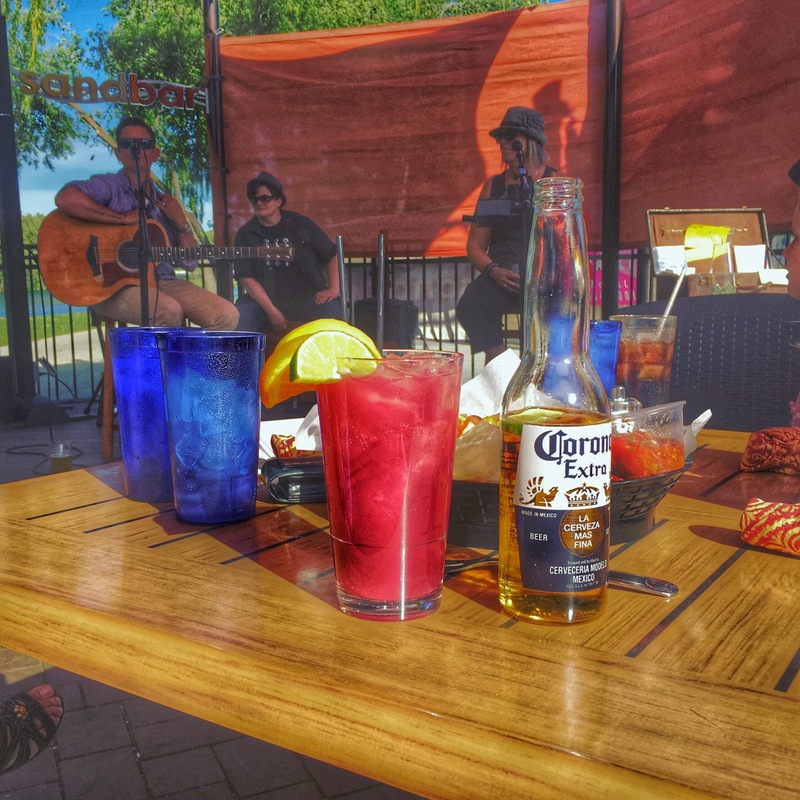 We had nachos and drinks at the aforementioned Sandbar in the evening, with front row seats to a set by Rebecca Scott. Yes, I recommend the sangria. Evening settled on us with cooler temperatures, so we ventured inside for dessert (and more drinks, because that’s the glory of the staycation – no one has to drive), where guitarist Ben Burdick played a jazzed and spirited version of the Sesame Street theme for our kids. 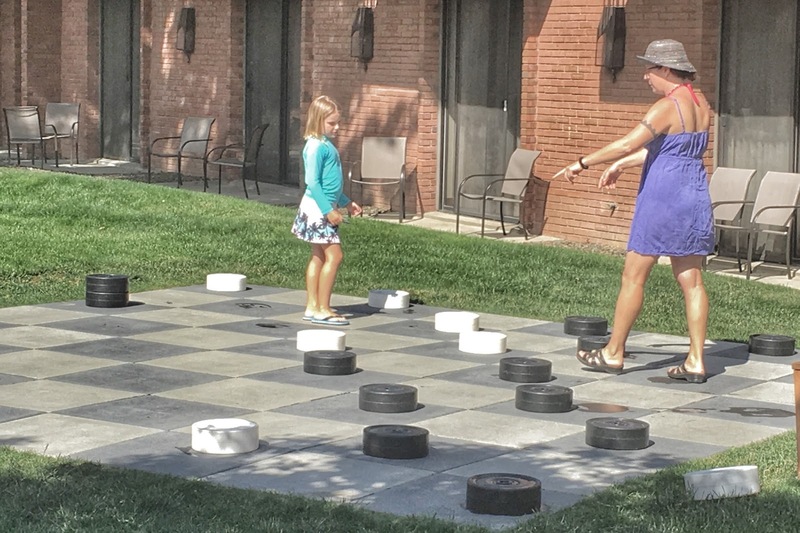 We followed this with a game of chess at one of the lobby’s oversized game boards. The following day I played checkers with my daughter on an even bigger game board outside. Yes, I let her win. 4. Pack Light and Smart: One of the beautiful things about a staycation is that when you return home, you don’t have to unpack to the extent necessary after a vacation, which to me has always seemed terribly anticlimactic. But a staycation should allow even the worst over-packers to wrangle their possessions into one manageable backpack. Okay, and one personal item. But if you’re driving five minutes to a hotel in the town in which you live with more luggage than you’d be allowed to carry on a plane, you have a serious problem. The good news is that unlike airports, your hotel room allows liquids. Pack that mini-fridge with juice boxes and champagne. You can offset otherwise (ahem) excessive bar tabs, while still allowing both kids and adults to live it up. 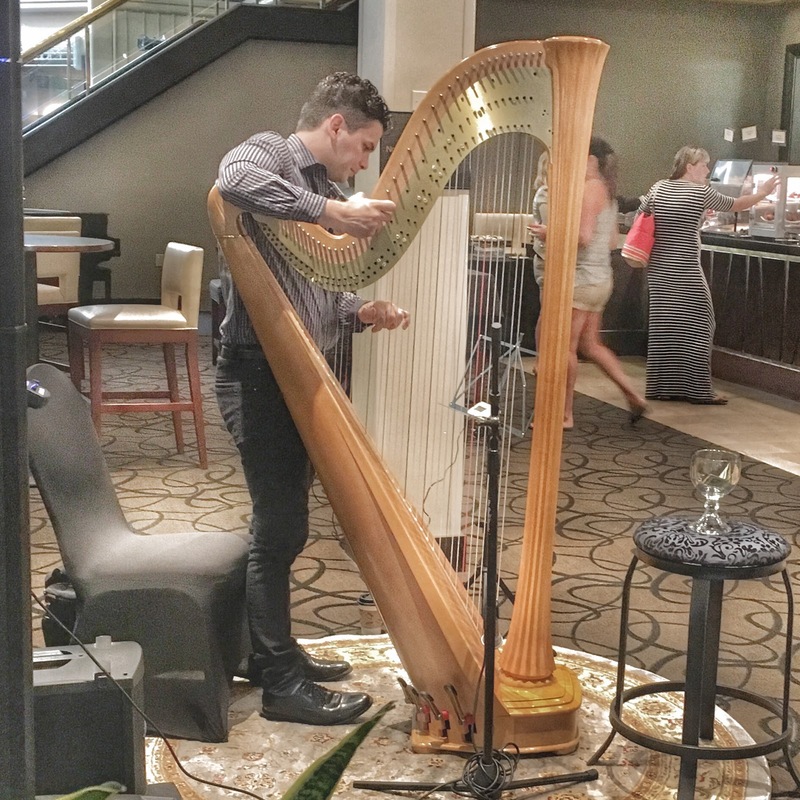 Matthew Tutsky preps his harp to accompany the Riverside’s killer brunch. The harp pairs well with bottomless mimosas. 5. 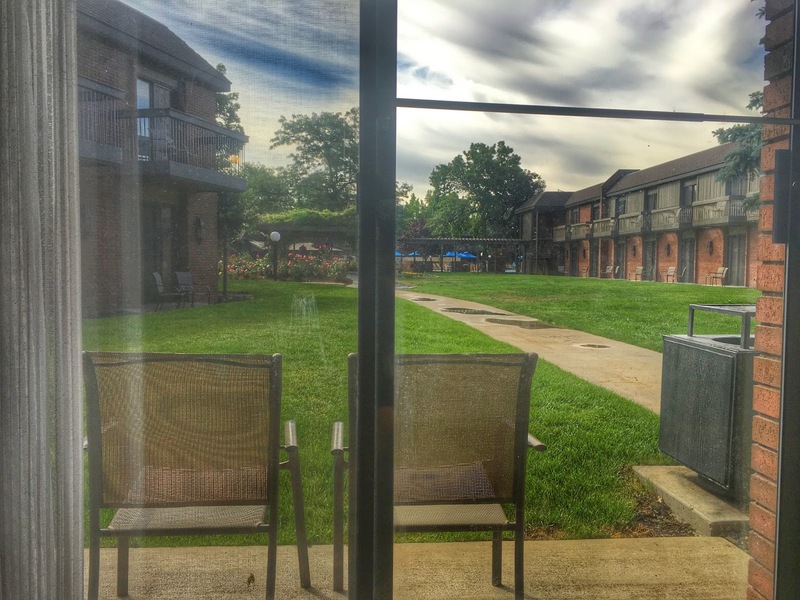 Be Weather Independent: In the days leading up to our staycation, the forecast changed dramatically. Gone were the triple digit days, replaced by predictions in the low seventies. Instead of whining about the weather, we embraced it and NEWS FLASH: It turns out that one can still get a respectable sunburn with temperatures in the low seventies. It was an ideal day for hanging out by the pool, enough sun to warm me but not so much as to turn me into a wilted, sweaty mess, which has never been my best look. My daughters didn’t mind, happy for the opportunity to frolic in a pool and hot tub no matter the temperature, in that steel-skinned oblivion to cold that only children seem to possess. The weather might have scared off others, as we had the pool largely to ourselves, which worked out just fine. The point is that you can’t control the weather, so there’s no point in worrying about it. Commit to having fun, come what may. 6. Look for Deals: A staycation saves you money on transportation costs and theme park admissions. Take it a step further by looking for actual staycation deals. We love the Riverside because for $150 during the week or $170 on the weekend, you get the room, all of the amenities, and a darling little tote with pool accessories, like sunscreen, water bottles, and an inflatable beach ball, but you also get a $50 credit toward food and drink and a complimentary breakfast buffet. And I’m not talking about a crappy continental breakfast. I’m talking bottomless mimosas, prime rib, benedicts, omelets to order, and a donut station. Yes, you heard me right. Donut. Station. Like little pastries with different sauces to dip them in. It should be illegal, but I’m glad it’s not. A quick internet search with the name of your town and the word “staycation” might shine a light on just the perfect place. I’m a big fan of exploring, be it the world or your backyard. Every now and then you want some of the logistics handled for you or maybe a full vacation isn’t in the budget. If that’s the case, try putting a staycation on the calendar. Like any art, mastering the staycation takes practice. 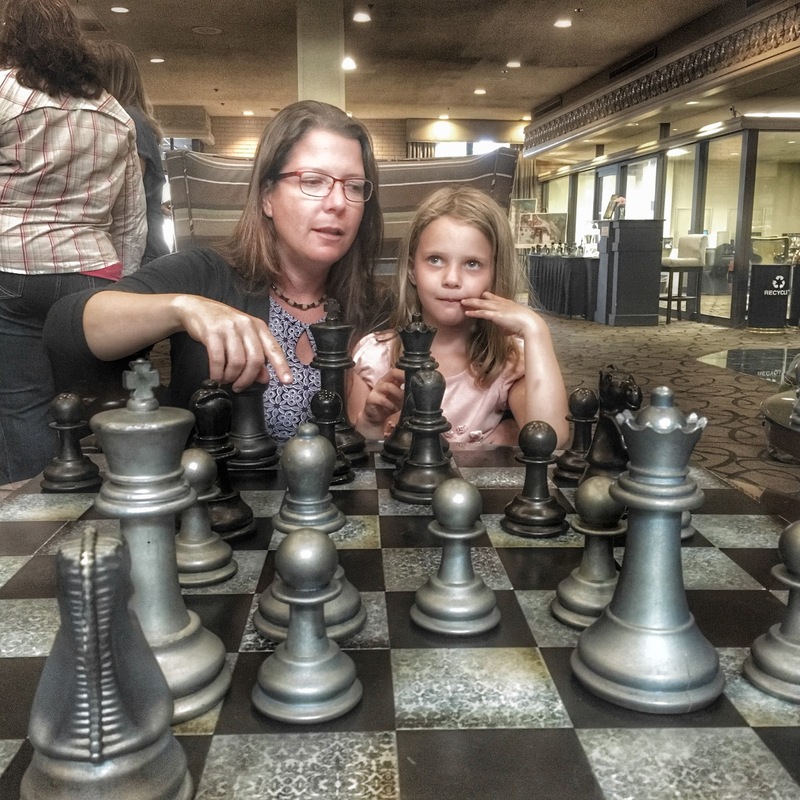 Finding the right place for your family doesn’t always happen on the first try, but it’s a heck of a lot of fun to figure out along the way. For more Summer Fun in Idaho, check out Boise’s Best Beach.